Get free shipping when you use my Vitamix link. My Vitamix Brought Me to a Whole New Level of Health and Wellness. In 2006, I was in college, going to Grad School in Washington DC. And one day I bought my first Vitamix online, on a whim. Before my Vitamix came into my kitchen, I was not getting enough leafy greens, nuts and seeds and protein in my plant-based diet. I was relying on too many convenience foods, processed snacks and bars, takeout, high cost smoothie shop smoothies, college campus junk food and more. Or even worse, I was skipping meals because I didn't have the time to grab or make something healthy and delicious before and in between my college classes. My body was craving more whole healthy foods. But I didn't quite know how to solve this problem. Wasn't this just how busy people eat? Nutrition is sometimes sacrificed when you have life to deal with, right? I was wrong. For me, there was a solution. And my Vitamix was a big part of that. Flashback to 2005 / PRE_Vitamix. My hectic schedule, balancing full time work and full time graduate college, left me fatigued, stressed and running on fumes. My body was ACHING (literally) for better nutrition. I was vegan, but back then, being a healthy vegan was much more challenging because there was less info about a healthy vegan diet and less #vegan-friendly products on the market -- way less. And as a busy college student, I wasn't paying enough attention to my nutrient intake. My friends and family would have called me a very healthy eater back then, just because I was vegan. But I knew inside that something was missing. Greens! More fruit. Superfoods. Easy protein-filled shakes. Smoothies Save the Day. For lunch on campus, I would head to my favorite on-campus smoothie bar and get a giant smoothie. It always made me feel amazing. It was fast, easy, delicious and packed with loads of healthy plants. I tried replicating those smoothies at home with my "cheap" blender and it never worked out. The fruit was always clumpy and grainy. I could never grind up flax seeds or hearty greens or fruits like apples or oranges - no way! I tried a green smoothie in my blender and it was a chunky mess. I vowed to never blend green smoothies again and thought I just didn't like them. But really, who would like a chunky green smoothie? Enter a Vitamix-blended green smoothie! Huge difference! Enter my Vitamix. For the first time, EVER, I made my own delicious, smooth and silky Green Smoothie. Leafy greens, fiber, vitamins, nuts, seeds, protein and all pulverized before my very eyes into a thick, frosty, sweet, silky green shake. And I was shocked at how freaking delicious, I mean incredible, that green smoothie tasted. I remember chugging it and wondering why in the world I didn't make one of those sooner. Then I made my own acai smoothies. My own frosty banana ice cream shakes. My own blended homemade soups. Almond butter and homemade jam. DIY hummus beyond my wildest dreams. Check out my Vitamix Blending Playlist on YouTube!.. What an epiphany my Vitamix was to this whole other level of nutrition and healthy eating I could reach with this new tool -- a high level I never even knew existed. In my Vitamix I blended to my heart's content. Blueberries blended with zero clumpy skins getting stuck in my teeth. Acai smoothies were now made in MY kitchen rather than a smoothie cafe. (I even made my FIRST YouTube video with my Vitamix and an acai smoothie!) 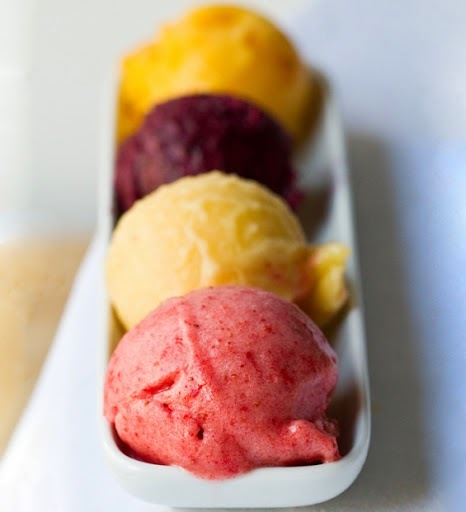 Frozen bananas whipped effortlessly into frosty, creamy banana ice cream. And my Vitamix allowed me to fully fall in love with my kitchen time. With my Vitamix. Every recipe. Every meal felt easier. And more whole. I was using more whole foods to make basics like flour, non-dairy milk, soups and sauces from scratch. More whole foods = yes yes yes. I started making fresh, homemade blended soups (I loved cheezy broccoli and creamy baked potato soups!) and I made newfangled dips like Sunflower-Asparagus, sauces and homemade salad dressing. I whipped up fresh pesto, the fragrant basil wafting in my face. I blended nut butters like a winner and whipped up vegan cashew cheesecake in a flash. Vegan cashew cheese was next on my list. Over the years I have come to make so many blender recipes that fill my body with nutrition and nourish my body and spirit. I truly LOVE my Vitamix. And lastly, my love of blending brought me to my first book deal: 365 Vegan Smoothies. Dream come true. All THAT from an appliance. Not bad. YOU Deserve a Vitamix! I believe EVERYONE would greatly benefit from having a Vitamix in their kitchen to help them live a healthier, happier life. Healthier is easier with a Vitamix. Cooking is easier with a vitamix. These are words I 100% stand behind. This is why I bought my parents a Vitamix. And why I tell everyone I love to put a Vitamix on their "wish list" of investment purchases. Vitamix is the ultimate tool for obtaining a healthy living lifestyle. And you do not have to be a chef to own a Vitamix. Newbie cooks will love the ease and versatility of their Vitamix. My Vitamix is hands down my favorite kitchen appliance and I use it at least twice a day (or more), every single day. Some of my favorite Vitamix recipes include: smoothies, soups, sauces, dressings and desserts like cashew cheesecake! *disclosure: This post contains a Vitamix affiliate link. 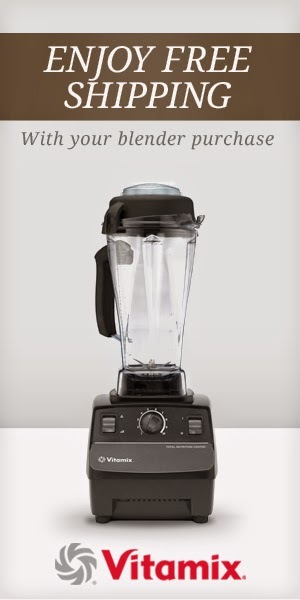 Ready to buy the best blender ever? Get free shipping by using my link!